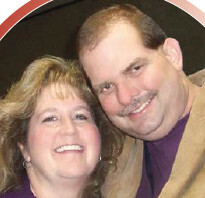 On June 14, 2011, after a 107-day wait in the hospital at Mayo Clinic in Rochester, Minn., Kirk Watson, 44, received the news he’d been waiting for — a heart, liver and kidney were available for him. He would be the fourth person to receive a triple transplant at Mayo Clinic and only the 11th in the United States. The organs for transplant didn’t arrive without a glitch. A storm delayed their arrival via plane for a few hours. Watson and his wife, Rita, watched the thunder and lightning from the window of the hospital room while they waited. Watson went into the operating room at midnight. Halfway through the next day, his surgery was complete. Watson has hereditary amyloidosis, a relatively rare blood disease that develops when protein builds up in organs and tissues. Affected areas can include the heart, liver, kidneys, spleen, digestive tract and nervous system. Hereditary amyloidosis often is not diagnosed until significant organ damage has occurred. The symptoms can be confused with other conditions. Watson first had symptoms in 2002. He was exhausted and had inexplicably gained 30 pounds. He was diagnosed with a viral heart condition and told he would need a heart transplant. For several years, he says his physicians in Colorado were able to maintain but not improve his condition with medication. In the last few years, Watson’s day-to-day activities had become significantly limited. He’d had to quit working as a deputy sheriff in Boulder, Colo. In 2008, a DNA test confirmed Watson had hereditary amyloidosis. His aunt was diagnosed with the disease at about the same time. She was one of the previous triple transplant patients at Mayo Clinic. Watson remained in the hospital for 12 days immediately after the transplant and in Rochester at the Gift of Life Transplant House for several months, post-transplant having cardiac rehabilitation three times a week. “I can feel my body rejuvenating,” he says. “Before my surgery, my extremities were blue-tinged due to poor blood flow. Now, they’re pink like they should be.” He expects to return to normal activities within 12 to 18 months. At least 10 other members of Watson’s extended family also have been diagnosed with hereditary amyloidosis. Whether the disease will require treatment or transplant remains to be seen.